If you are wondering how to install a washing machine, then you are in luck! I have installed, moved, replaced and setup many washing machines in my day and I can teach you. Let's start with the easier scenario: Replacing a washing machine. 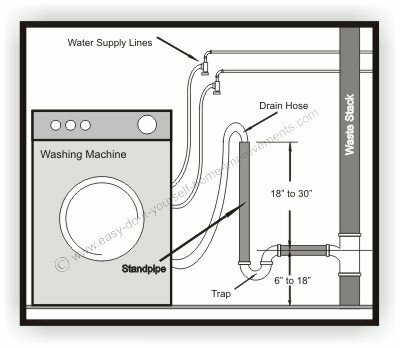 If you need to install a new washing machine drain and feed lines, Click here. First thing, shut off the water supply to your old washer. 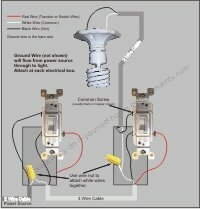 Unscrew the feed lines from the shut-off valves carefully. There is water still in the lines and that will leak on you floor so have that towel handy. Disconnect the drain hose and pull out the washing machine. You may want to have some help with this, those washers can get pretty heavy. Now, place your new washer in position and ensure that it is level. There are usually screws down by the feet that can be adjusted to level the washer. 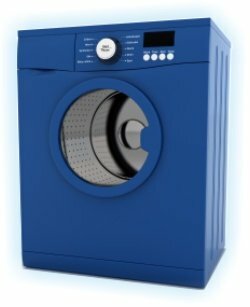 Make double sure that the washing machine does not rock. Hook up the drain in the same fashion that you removed the old one and connect new feed hoses to the hot and cold water. 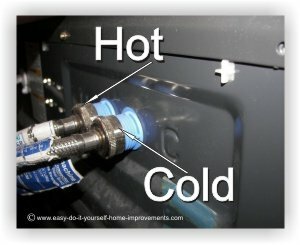 If your new washer only has a cold water inlet, only hook up the cold water. Installing a washinge machine doesn't get any easier than this! If you want to take an extra precaution, wrap the threads with a layer of teflon tape before connecting the hoses. This will help in the reduction of leaks. After your hoses are all connected and tight, turn on the water supply and watch the connections for a minute or so. Come back and check on the connections every 5 - 10 minutes to make sure there are no leaks. All good? Perfect. That was the easier way to learn how to install a washing machine, the next section is a new installation. Got your supplies? Let's get started. Once you determine where your new washing machine is going, you will have to bring in some new water supply lines. Layout out the new run of copper pipe fully (or at least in large pieces) and solder it together. 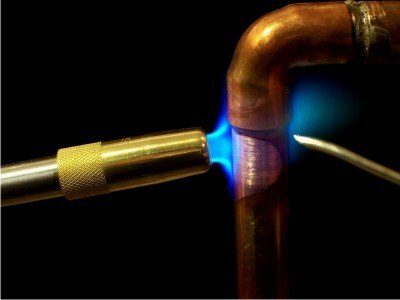 Click on this link to learn how to solder copper pipe. Be sure to label which is hot and which is cold. Some of the newer washing machines are cold water only. If this is the case, you just cut your work in half! When it comes to installing the washing machine drain, there are a few things to consider. I always try to have the drain pipe near the washer so I can use the drain hose that comes with your new washing machine. If you have a laundry tub beside your washer, you can position it so it will drain into the sink. This would be by far the easiest and quickest way to drain your washer. 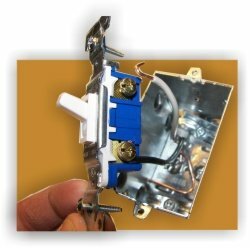 Is it the best way how to install a washine machine? It depends on who you ask I suppose. I like to have things "just-so" so I would not drain it into the sink. TIP: Always check your local building codes to determine what is the proper method for a washing machine drain. What you need is a standpipe drain. Some hardware stores sell pre-made washing mashine drain pipes or you can make your own. All you need is a 34" length of 1 1/2" ABS, and a P-Trap. Glue the pieces of ABS together using ABS solvent glue and then use a "Y"-adaptor to attach the washer drain to the waste line. Now that you have successfully mastered the washing machine plumbing, the actuall installing of your new washing machine will be a cinch. 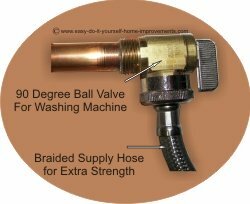 Attach your new braided supply lines to your shut-off valves and connect them to the corresponding inlet on the washing machine. Put the hook-end of the drain pipe into your newly fashioned standpipe drain and fasten with a hose clamp. Push the washer into it's space and level it. You are now a do it yourself master on how to install a washing machine! Enjoy those fresh clean clothes.